The Terror Live (더 테러 라이브) is a rare breed of Korean thriller. 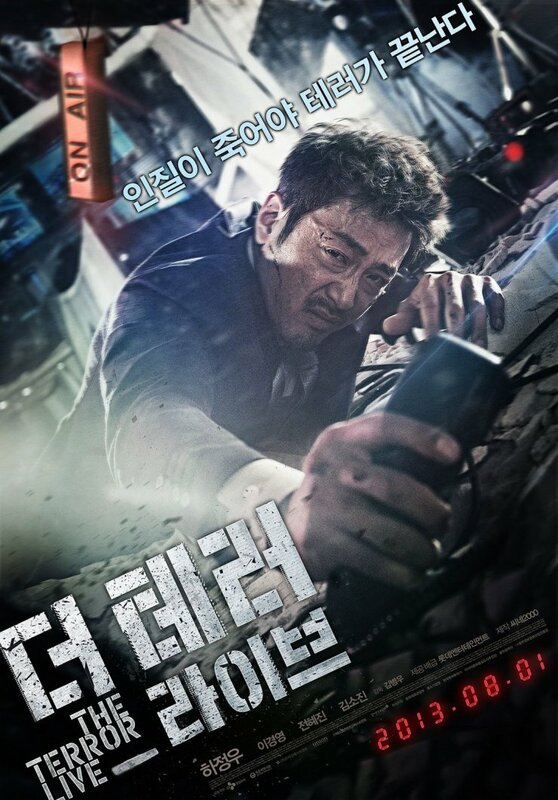 Featuring superstar Ha Jeong-woo (하정우), the film takes place almost entirely within a single room rather than racing against time around a city. As such it shares several tropes with Joel Schumacher’s Phone Booth, ramping up tension through the claustrophobic setting while simultaneously exposing the lead protagonist for past bad deeds. 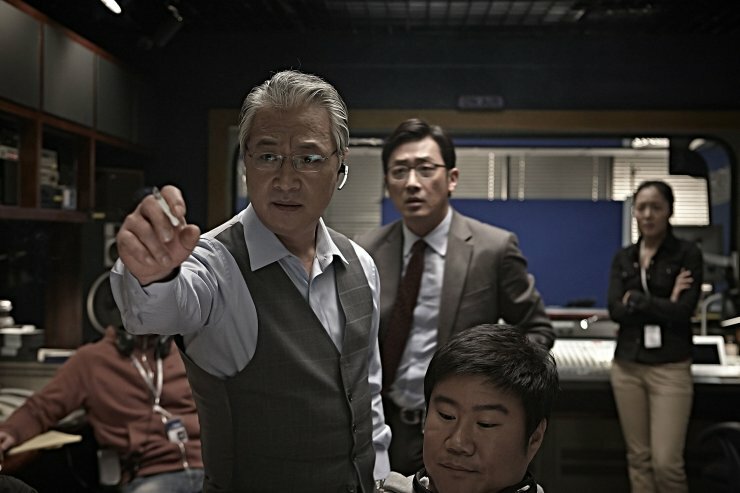 Within the highly restrictive setting director Kim Byeong-woo (김병우) does an excellent job in generating suspense, while the critique of the highly competitive – and corrupt – world of the newsroom makes the thriller a surprisingly deep cultural examination. However, the film is let down by a lack of characterisation in regards to the central roles while the tension is often undermined by arguably unintentional comedy. Despite such shortcomings The Terror Live is a unique and interesting addition to the genre, and one which leaves audiences wondering about the villains in society after the credits have finished rolling. Recently divorced and demoted to a radio show host, Yoon Yeong-hwa (Ha Jeong-woo) couldn’t care less about his new role as he repeatedly offends callers with his brusque manner. However when one caller phones in and claims to have primed bombs on Mapo Bridge located near the station, Yeong-hwa scoffs – and moments later the bridge is in ruins. Seeing this as his chance to return to the spotlight as a TV news anchor, Yeong-hwa teams up with former manager Cha Dae-eun (Lee Kyeong-yeong (이경영), quickly setting up a newsroom and broadcasting the terrorists demands instead of reporting to the police. As the ratings skyrocket and other news agencies struggle to catch up, it quickly becomes apparent to Yeong-hwa that something is very, very wrong as the terrorist becomes increasingly fixated on him personally, intent on exposing his checkered past. One of the great strengths of The Terror Live is in conveying the cutthroat manner executed by those in power and in the media. The thriller is one of the few films to tackle the issue of real news and the mediated news presented to society, capturing the seemingly inherent corruption and societal risks taken in the war for ratings. Within this framework Yeong-hwa – whose name literally means ‘movie’ – is very much at home and director Kim does a superb job in slowly drip-feeding character information throughout the narrative. From the outset Yeong-hwa is certainly in-keeping with other thriller anti-heroes as he thrives in the grey areas of morality, only coming to reconsider his position due to the threat of exposure. As such the anchorman must not only acquire, filter, and present the news to Korean society and outwit a terrorist on live television, but also fend off a damaging character assassination attempt and please his management. Juggling so many plot threads is consistently riveting viewing, as new dimensions to the case constantly challenge everything Yeong-hwa and the audience have come to learn, driving up suspense for a thrilling viewing experience. Ironically however the inclusion of so many plot threads is also one of The Terror Live‘s key flaws, as there is so much going on that character development is sacrificed. Ha Jeong-woo is a gifted actor and performs very competently, yet he is given little to work with as Yeong-hwa other than being a shrewd and morally ambiguous news anchor. The same criticism also applies to the terrorist, who clearly has strong motivation for his attacks but is a rather two-dimensional antagonist. Luckily director Kim’s highly kinetic camerawork keeps such issues at bay featuring a variety of techniques including crash-zooms and realism-inducing camera shaking as well as more traditional fare, while the rapid editing helps to ramp up the tension without ever becoming nauseating. The suspense generated within the confines of the newsroom is very impressive, yet bizarrely there are often instances of unwarranted comedy that serve to completely undermine the tension. It is difficult to know if such moments are intentional or not. When Yeong-hwa struggles with a situation and begins swearing at his oppressors it is incredibly funny, although the straight faces within the film suggest otherwise. Once the comedy has passed however it’s back to business and the dramatics increase further, leading to a daring finale and a potent commentary on Korean politics and the media. The Terror Live is a rare and highly interesting thriller. 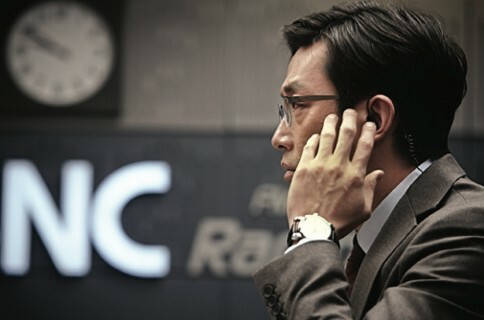 Within the confines of a newsroom director Kim Byeong-woo does an excellent job in escalating tension by featuring a variety of camerawork techniques, while the story regarding corruption within both Korean media and the government is a potent socio-cultural critique. While the lack of characterisation and (arguably unintentional) comedy undermines the suspense, there is more than enough on offer to provide an entertaining thrill-ride from start to finish.